Hughes Kitchen in Teesside – The brief? A very large home with beautiful curved glass walls in the entrance hall, one of which is also part of the kitchen. When Mr and Mrs Hughes first met with Court Homemakers they knew they wanted a lighter feel to the kitchen and wanted something different. This would be something that they wouldn’t see in everybody else’s home. 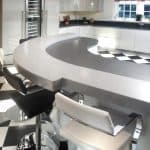 After visiting the showroom in Stockton, and with the help of Michael (their designer), they settled on a huge, sweeping, curved design that perfectly complemented the curved glass wall and enabled them to utilise the new larger space in their kitchen fantastically well. What are your stand-out/favourite features? 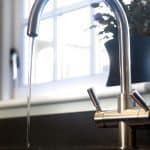 Mr & Mrs Hughes had already used Court Homemakers 8 years ago to design, supply and install their kitchen in the same Teesside house. Pleased with the results, they decided to use Court Homemakers again on this much larger project, which involved having a supporting wall removed. What other special touches stand out? 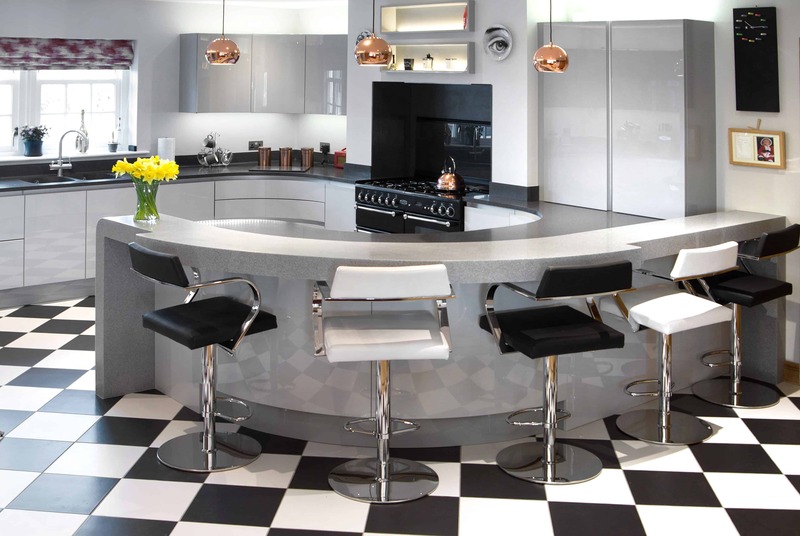 Court Homemakers suggested complementing the Kitchen with a checkerboard floor tile that pays homage to the curved theme. 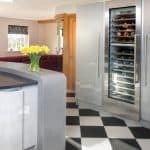 Another focal point in the Siemens A-cool wine cooler, which is perfect for entertaining as well as everyday use. Were the clients happy with the results? The finished project went above and beyond Mr and Mrs Hughes expectations. The whole area is well lit and everyone in the family enjoys the space. The kids can watch TV while Mrs Hughes prepares the evening meal which brings the family closer together. Entertaining works really well too. The Hughes are over the moon with the result and really happy that they, once again, chose Court Homemakers to make their dreams a reality.